Trackpackagehome.com is a browser hijacker that is promoted as an extension that will supposedly allow you to track your packages. It can get into your computer via software bundles and infect without you even noticing. Fortunately for you, Trackpackagehome.com is not malicious. It will not directly harm your computer but it will make changes to your browser and possibly try to redirect you to sponsored pages. This is your typical browser hijacker behavior because they exist to direct traffic for sponsored websites. The biggest problem with these redirects is that some hijackers are able to lead users to malicious sites where they could accidentally download malware. If you are not careful, you could seriously harm your system. This is why you should remove Trackpackagehome.com as soon as possible. Browser hijackers use the bundling method to enter your computer and that is why they are so widespread. They are attached as additional items that technically you can choose to install if you want but they are set to install automatically, unless you manually prevent them from doing so. When you install free software, simply choose Advanced or Custom settings and deselect everything that has been added. After you uncheck those boxes, you can proceed to install the freeware. Doing this is much easier and less time-consuming than it would be to delete Trackpackagehome.com later on. As soon as it enters your computer, the hijacker will take over all popular browsers installed, and that includes Internet Explorer, Google Chrome and Mozilla Firefox. It will set Trackpackagehome.com as your homepage and new tabs and you will be stuck with these settings until you remove Trackpackagehome.com browser hijacker. 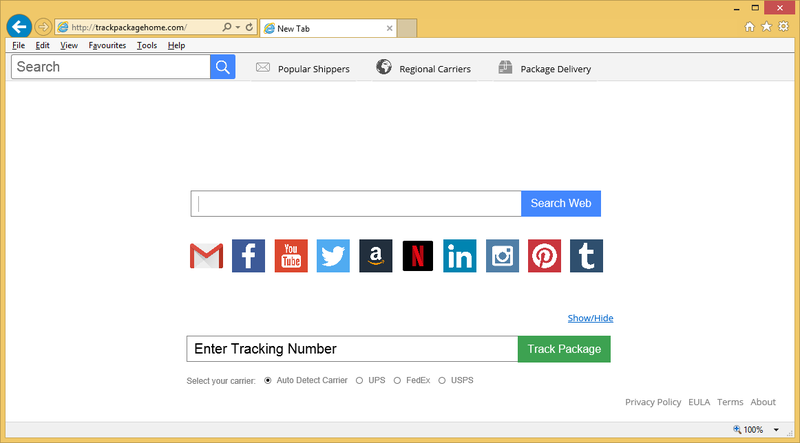 On your new homepage, you will see a search bar, links to popular pages like Gmail, Facebook, YouTube, Twitter and Tumblr, as well as a service to help you track your packages. The search engine will lead you to My Yahoo Search so be careful of sponsored pages. It will become your default search engine and that can be irritating, seeing as you did not choose it yourself. Browser hijackers exist to redirect you to those sponsored pages so be careful. While not necessarily the case with every hijacker, some are able to lead users to malicious pages where malware could be lurking. Uninstall Trackpackagehome.com. If you can find where the hijacker is hiding, you may be able to delete Trackpackagehome.com manually. Additionally, there will be instructions provided below this article. If you do not feel confident with manual Trackpackagehome.com removal, you may want to obtain professional removal software. Those programs are designed to find and erase Trackpackagehome.com or similar so there should be no issues.